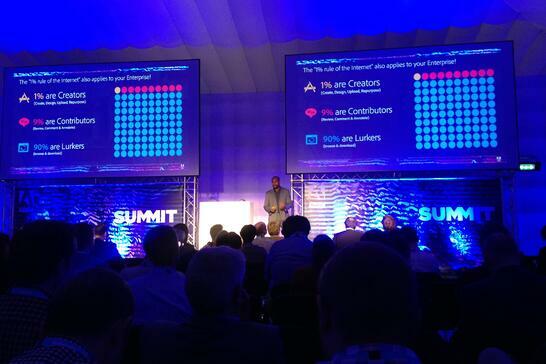 Another year at Summit: for the sixth year running Luxus Worldwide participated in the Adobe Digital Marketing Summit EMEA in London. Our leading asset creation and management tool Drafthorse once again received great feedback and interest from Summit participants. Thanks to everyone from Adobe who helped make Summit so successful for us – and to all of the Adobe partners, customers and new acquaintances we met this year! Last week the Adobe Digital Marketing Summit EMEA 2016 brought another round of exciting product announcements, demos, sneak peeks, marketing cloud case studies and inspirational keynotes. The content at Summit continued to articulate Adobe’s long-term vision of how they are developing the marketing cloud, along with their ambition to become the one-stop-shop for digital marketing – the same way they’re the one-stop-shop for creative content creation. The big three themes across the event this year were: 1) the transformation and challenges of becoming an experience business, 2) content velocity & marketing, and 3) how data and insights are driving experiences. "We are no longer an economy of products and services. Experiences are what matter." The vision that drives Adobe’s marketing cloud and product development is that the role of the products and services that businesses are selling has changed. Products and services are now secondary, and it's now end-to-end experiences that businesses are selling. For Adobe this is a fundamental transformational shift that is similar to previous enterprise business shifts in automation and connectivity – and likewise driven by developments in technology. This move towards experiences and experience-driven business is something that’s been in the mix for several years, but more recently, there is a sense of urgency around the topic. Digital and marketing technology has matured to the extent that businesses are getting caught out if they aren't adopting ways of thinking and working that take experience into account. If experiences are the new business model, moments are the currency of that model. The importance of experiences and moments to customers is not a new message or innovation, but rather an accelerating trend in product design, product development, marketing, communications, and support (essentially all areas of a business) that cannot be ignored. As digital becomes more mature and marketing technologies more integrated, the trend towards experience and the value generated by individual moments become more pervasive across devices, media types and touchpoints. In terms of product development and announcements to support the larger vision of experience-led businesses, Adobe put a lot of emphasis on the capabilities enabled by the latest release of Adobe Experience Manager (AEM), its acquisition of Livefyre and plans to integrate within AEM, the latest release of Adobe AEM Assets, and integrations and features within Adobe Campaign and Adobe Analytics. If we looked at a frequency distribution of catch-phrases at Summit this year, “content velocity” would be the clear winner by a long shot. Content marketing is not new, but the trend towards content-based and content-first approaches is clearly accelerating. The opportunity presented by leveraging the value of user-generated content to personalize experiences is clearly something marketers cannot ignore. Adobe’s recent close of the acquisition of Livefyre, a content curation & audience engagement platform was a central focus on this topic at Summit. 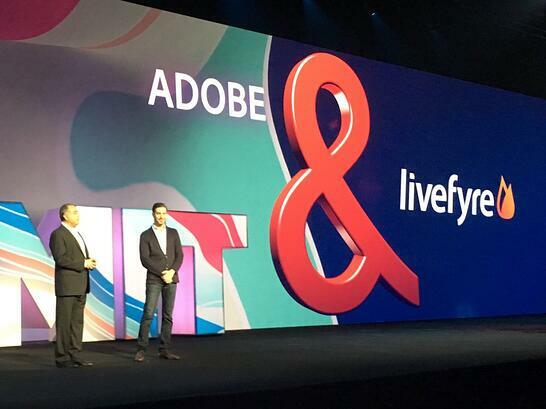 The integration of Livefyre into the marketing cloud will plug a gap when it comes to content marketing, and provide Adobe Experience Manager with significant new capabilities. Livefyre’s existing AEM integration already allows user-generated content from social media to be managed within AEM Assets in the same way that on-site or native content is managed. Livefyre also comes along with a host of ‘apps’ that enable marketers to drive the creation of user-generated content using various engagement mechanisms and curation tools. Adobe has put a lot of energy and focus into developing AEM Assets, and the development is something we’ve followed with a great deal of interest. Dynamic content and AEM Assets is something that Luxus has extensive experience with, having worked with AEM and Adobe Scene7 with a variety of clients over the years. 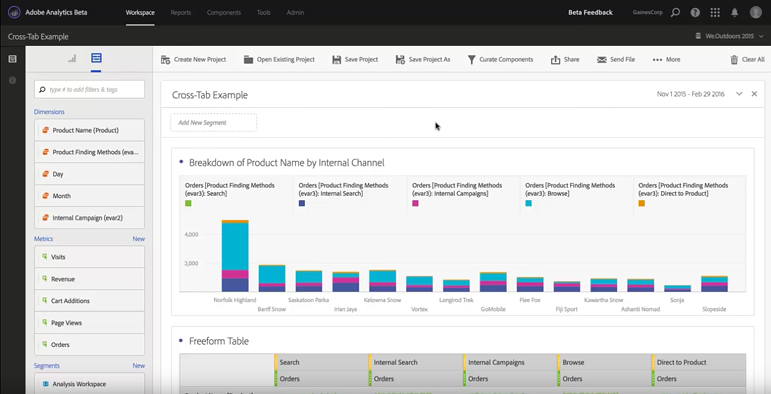 The release of AEM 6.2 and the latest version of Assets includes deeper integrations between AEM and the Adobe Creative Cloud, a desktop application for seamless local asset management, shoppable videos (embedded directly in AEM), as well as the Insights View, and integration between Adobe Analytics and AEM Assets. Our own marketing asset creation tool Drafthorse is integrated with AEM Assets and featured on the Adobe Marketing Cloud Exchange. The last major theme throughout Summit was data, insights, intelligence, and the role they have to play in driving improvements and optimisations across experience-driven businesses. We have hands-on experience at Luxus using Adobe Analytics and Analysis Workspace to help drive value and insight for our clients. If you're not already familiar with it, Analysis Workspace is a flexible and intuitive environment that enables marketers to generate powerful analyses and quickly visualize insights using Adobe Analytics data. The 2016 spring release of Adobe Analytics went live on April 21st, and featured new developments including: Activity Map, Virtual Report Suites, Scheduled/Downloadable Projects, Marking Cloud Audiences in Analytics (public beta), and Simplified Marketing Cloud navigation. You can watch a good summary video here, highlighting features from the spring release. Cross-tab analysis – great way to breakdown multiple engagement or conversion metrics across the same dimensions. Cohort analysis – allows you to group visitors/users according to when they performed an action. Advanced calculated metrics – advanced support for calculated metrics to count, combine, calculate and record values. Performance timing plugin-in – site performance and page speed matter, and this plugin allows you to monitor a comprehensive list of performance metrics within Analytics (Downloadable here). Custom date-ranges – review of how Analysis Workspace allows you to build custom date ranges that can be used across Analytics. Histograms – show distribution of values using visualisations and segmentation in Analysis Workspace. We're excited about the continued development of Adobe's marketing cloud, the new integrations between its products, and what those integrations enable for businesses. If you're wrestling with your digital or integrated marketing communications, or need help operating your digital marketing cloud – we can help! If you haven't already, also be sure to check out more information about our marketing asset creation tool Drafthorse.